Mustard application is now easier than ever at Tokyo Disney Sea! What does a Rolls Royce Phantom and a Jules Verne inspired ride vehicle in Tokyo have in common? Read on. 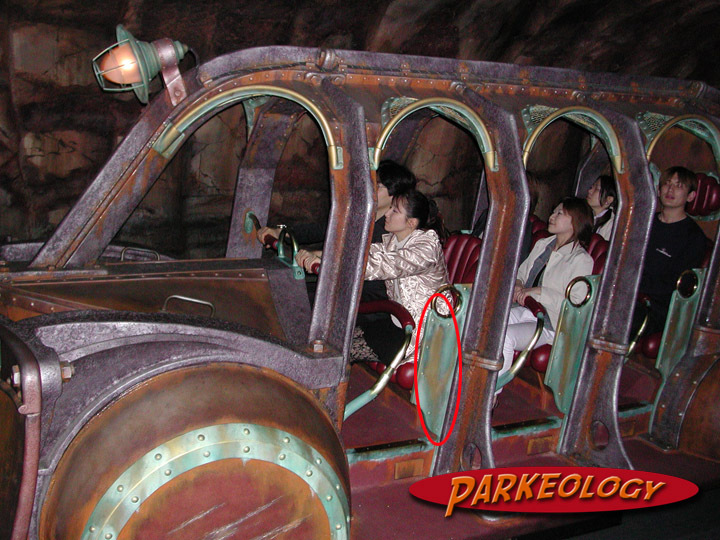 At Parkeolgy we are always on the lookout for the little details that Disney pours into the parks and attractions. These generally come in the form of unexpected effects or nods to the past. 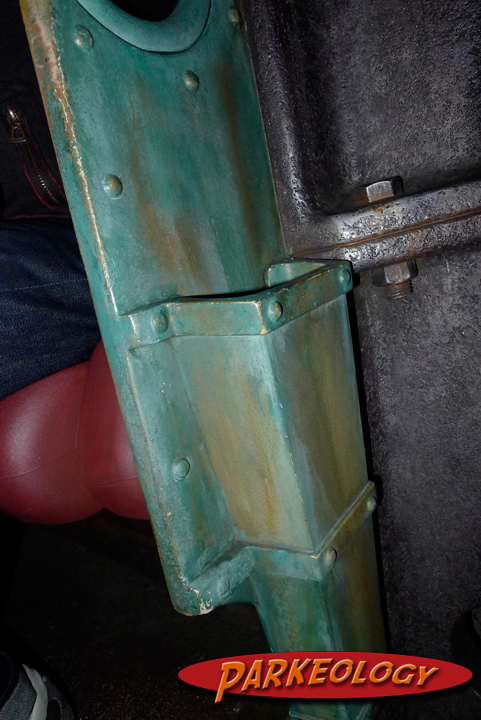 One could spend days going over the hidden references the Imagineers tend to hide. These details are often lost on the average guest but those who do pick up on them really appreciate the depth of the experience on offer. During my recent visit to Tokyo DisneySea I found a new detail but unlike the typical story enhancing efforts this one is purely functional. In fact I have never seen anything quite like this at Disney or any other park I have been to. Moreover it is new… it did not exist on my previous visits. Maybe a little bit of overkill? As you probably know due to the often-rainy conditions in Tokyo all of Main Street USA (in Tokyo Disneyland) is enclosed and re-named the World Bazaar. One would think that if they went to this level to keep guests dry that many other attractions would offer some sort of rain protection or accommodations and yet by and large there are no other concessions to rainy weather in either of the two Tokyo parks. It’s Tokyo folks not a Columbian rain forest, maybe building a giant glass canopy was a little bit of an over reaction to begin with. The rich have many “unique” problems to deal with. Nevertheless people don’t like being wet and perhaps especially not the Japanese who often wear nice clothes to visit theme parks (or just generally to live life… I don’t think they know what shorts are over there). That means many guests carry umbrellas with them if there is even a small chance of rain (or direct sun for the matter) and this is where the connection to the elite car collector comes in. Rolls Royce owners need their hands free to handle various tasks such as applying Grey Poupon mustard to gold plated caviar or casually blowing their noses with hundred dollar bills. 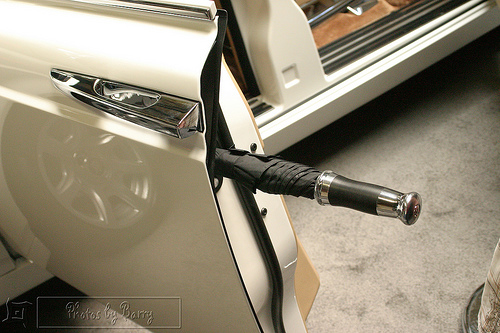 They certainly do not have time to be fumbling with umbrellas; therefore the Phantom has a convenient compartment to slide an umbrella into upon entering the car (or perhaps more accurately a place for the butler to slide the umbrella). When you think of it why don’t all cars have this? Do you have to be wealthy to not want to be wet? 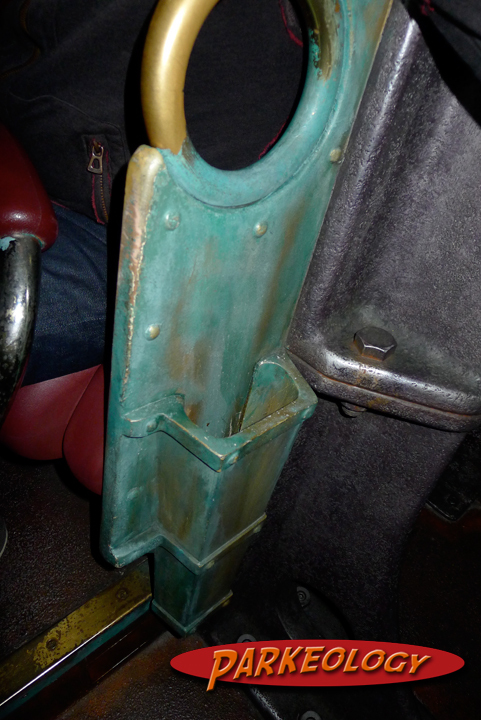 Well just like the Rolls the ride vehicles for Journey to the Center of the Earth now come equipped with built in umbrella holders! It just drops right in there and stays put for the ride. I’m not sure exactly when this happened but I do not believe they were in place in 2012 (my last visit) and I know they were not there much before that (I have photos of the ride vehicles sans holders before that). Previously the holders were not there. 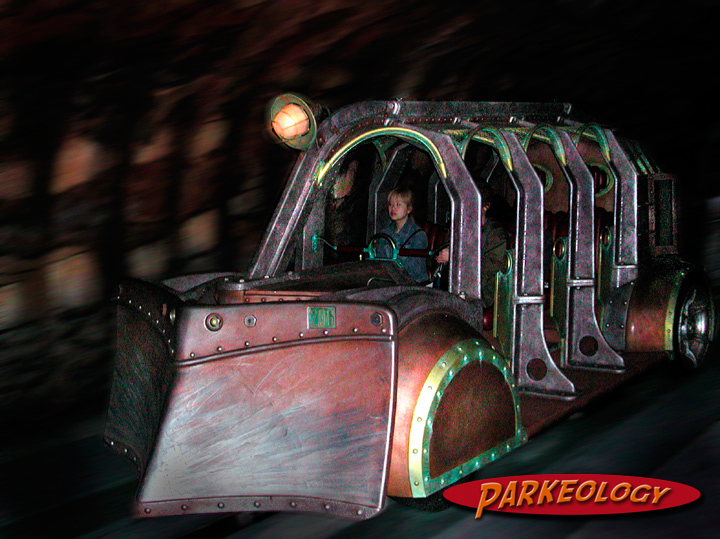 It’s actually a great idea and one that they should incorporate on more rides (maybe they are?). Rather than trying to hold what could in essence become a spear during a high-speed ride guests now just drop the umbrella into the exterior slot and it goes along for the ride, then they swoop it up upon exiting. Could also be used for canes, large loaves of French bread or pet snakes. I love finding little unique things like this but I also love knowing that it was recently added; that Disney is continuing to find small ways to improve the guest experience. This is one of those things that is likely “only in Japan” as their set of values and needs is quite unique. 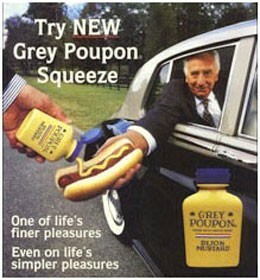 However I’d love to see it come to rides in the U.S. as well… just imagine the spike in-park high-end mustard sales would have! This entry was posted in Disney Theme Park Hidden Secrets and tagged Tokyo Disney Sea, Tokyo DIsneyland. Bookmark the permalink. Long time listener, first time caller. I lived in Japan from 2011 to 2013 and visited both Tokyo parks a ton. The first time I noticed the umbrella holders on Journey was in July 2012. Since that was also the first time I was carrying an umbrella at the park, I just assumed the holders had always been there. Really interesting to learn that they’re a recent addition! 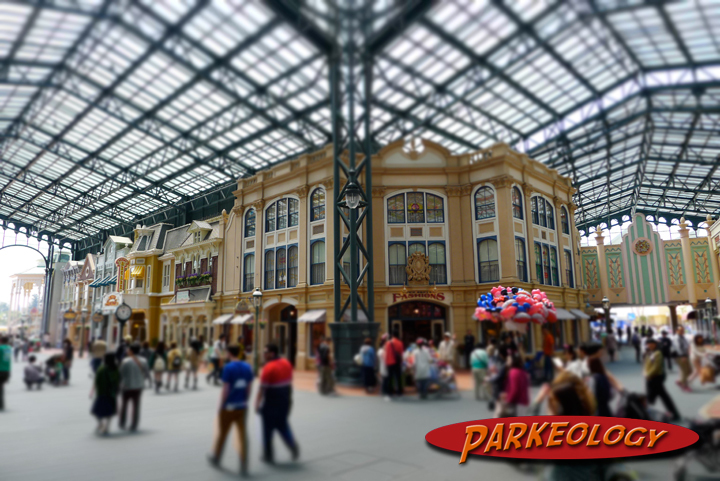 Also, having visited the parks during typhoon season, I would argue that the enclosed World Bazaar is not as much of an overreaction as one might think. To be honest I don’t really like the look of the World Bazaar closure but I can definitely see why they included it. Having the good fortune of never visiting the parks during typhoon season I must admit that I cannot fully relate. However what always struck me as a little odd is how little extra coverage there is elsewhere. For the most part outside if World Bazar Disney did little to hide guests from the rain. It’s very similar to the MK in that regard and trust me, I know from first hand knowledge that it can rain big time there as well. Yeah, I agree with you about that. I once had the experience of watching everyone in Westernland flee to hide under the store roofs until the rain calmed down. And of course those of us who made it to World Bazaar met a huge traffic jam. I haven’t made it to the Florida parks quite yet but hopefully there will be sunny weather when I do! That car is not a Phantom… it’s a Skoda! I thought it looked a little cheap for a Rolls but it showed the concept well. Image has now been updated to a sutably posh Rolls umbrella. They are similar in that they are both owned by German companies. So close call! The safari is particularly well suited to have exterior umbrella holders… it even sort of fits the theme in terms of asthetics… What is so odd / cool about this application in Tokyo is that it is on a fast moving ride. It’s just funny to see a vehicle moving at Test Track speeds with umbrellas clinging on to the exteriors…. and it also makes 100% great sense. This idea is so bizarre, it could only happen in Tokyo. And yet it makes a lot of sense. There are several Disney World attractions that should handle wet umbrellas a lot better. At the Safari, they actually removed the little net bags that are for holding things. So if you have a soaked stick with a zillion little wet fabric folds flayed out all over the place, your only option is to place it crossways at your feet.